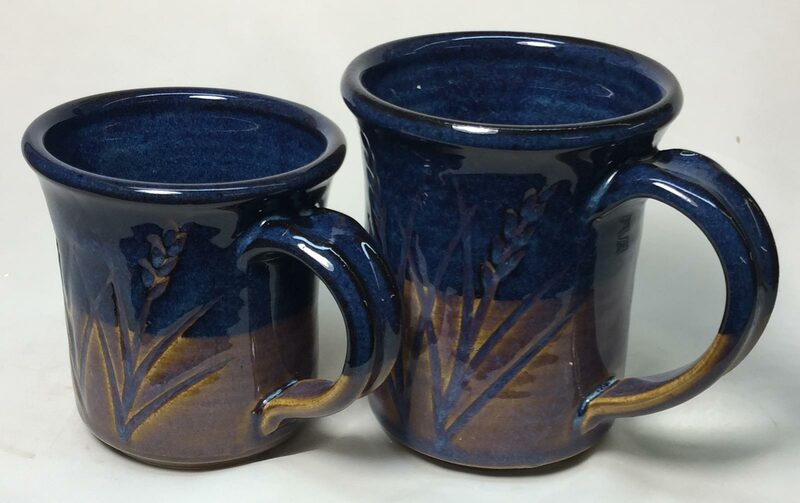 This glaze creates a bright blue yet contains none of the world's most expensive common ceramic material, cobalt oxide. It has a great glossy surface and variegates a from medium steel blue where it is very thick to amber clear (or a brown if the body is dark) where it is too thin. You will need to experiment to get it the right thickness in your circumstances. 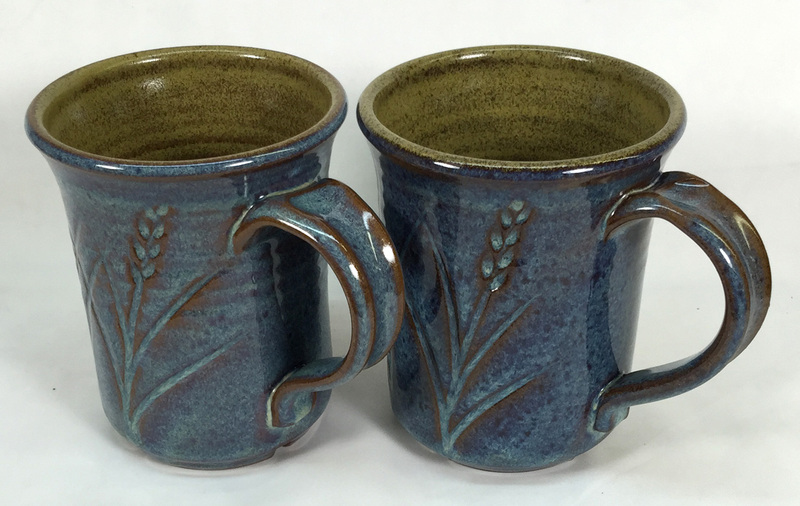 Try it on different clays and different thicknesses to find the best combination. It works best on stonewares. If it is melting too much or too little, increase or decrease the frit to compensate. 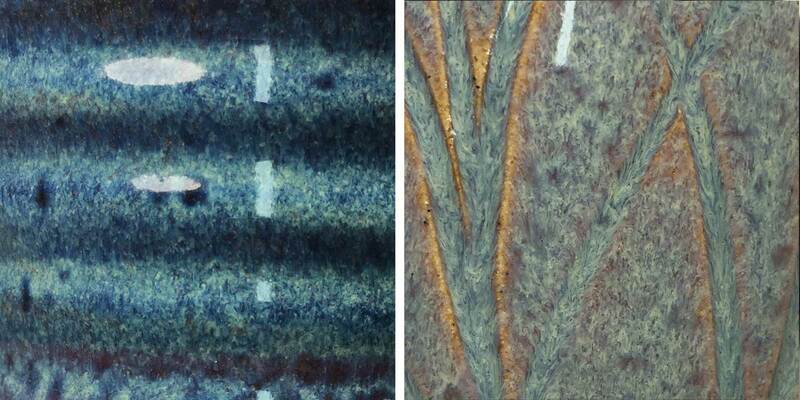 One possible caution: This glaze relies on the rutile variegation effect. Rutile can vary in chemistry over time and from place to place, so test this first before using and test it again when you get new supplies of rutile. THE FLOW COLORATION REQUIRES SLOWER COOLING. 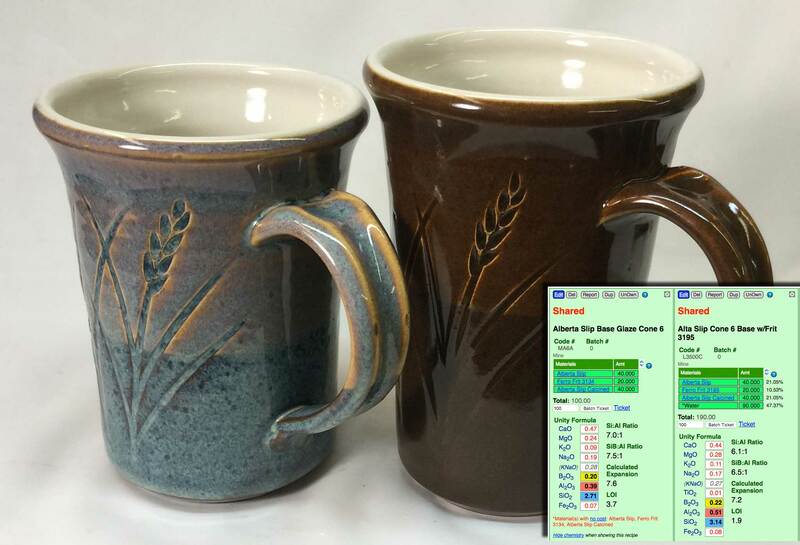 This can happen naturally if you fire packed loads or have a well insulated kiln, but it is generally best to program the cool (use the Slow Cool schedule link to learn more, it drops the temperature, then holds, then slows the cooling to about 1400F). You can also add 0.25% cobalt oxide to restore the color if you want to do a faster cool (to prevent transparent glazes clouding, for example)! If the blue is working, but less than you want, then add a little less cobalt. 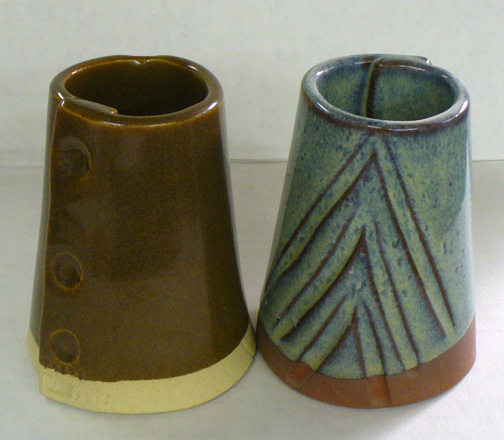 If the glaze shrinks and cracks too much on drying, then increase the calcine Alberta Slip and reduce the raw Alberta Slip. If it is too powdery on drying, increase the raw against the calcine. 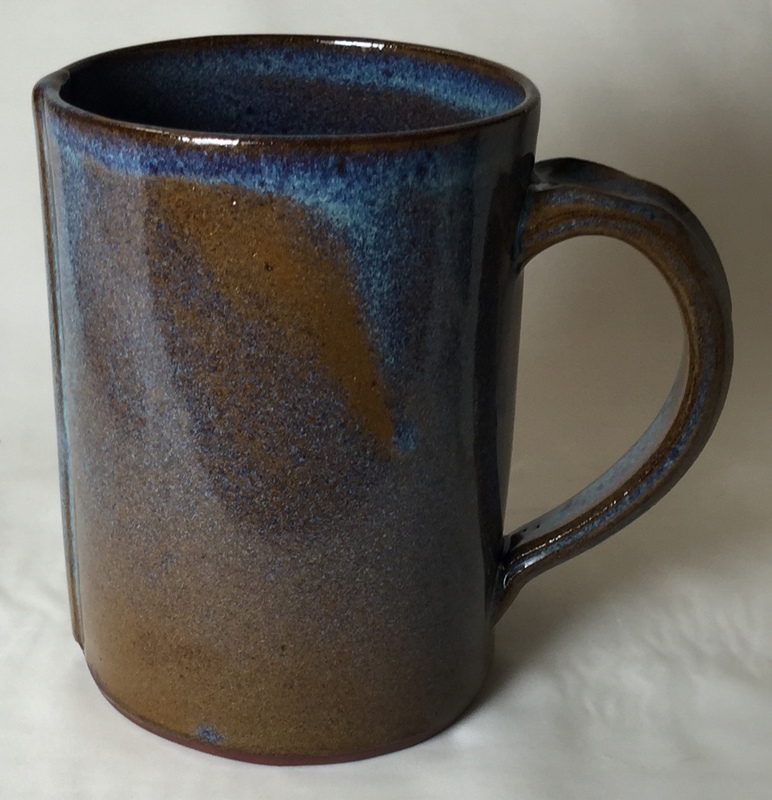 There is also a Ravenscrag Slip version of this glaze, it employs iron, cobalt and rutile (like the original David Shaner recipe). 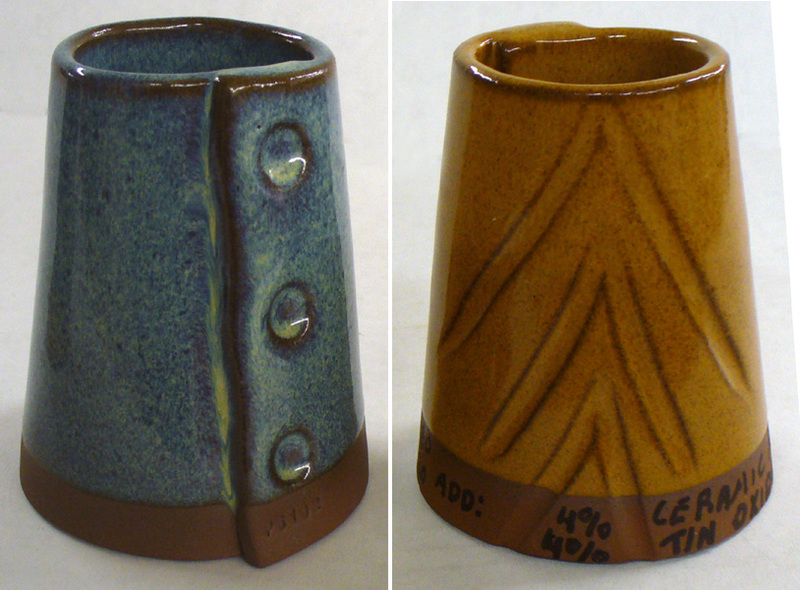 This mug has thin walls and was bisque fired to cone 04 (so it had a fairly porosity). As a result the glaze went on thinner when it was dipped. This was not evident at the time of glazing but at firing the thinner sections produced the brown areas. 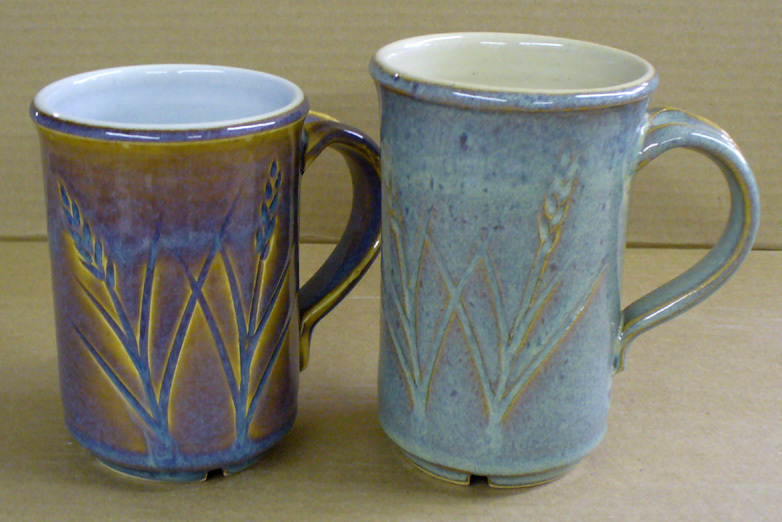 On Plainsman P300 (left) and M350 (right). 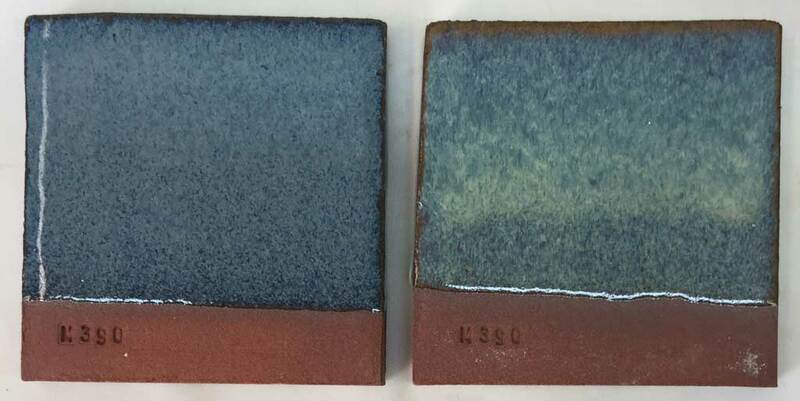 The blue effect is darker and richer than oxidation. The richer effect is also partly because the reduction kiln cools slower. The recipe is GA6-C. 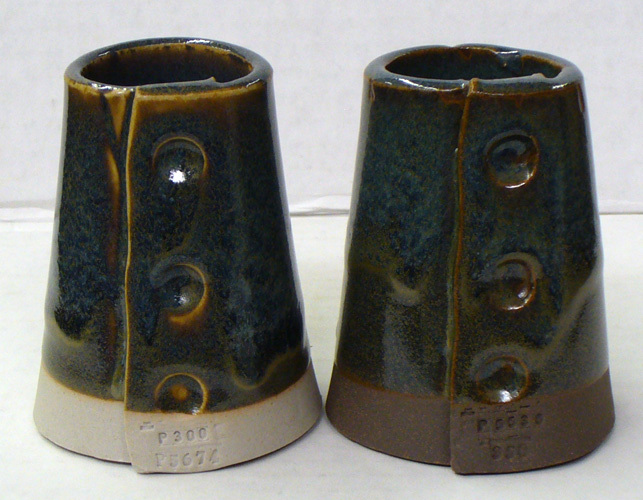 These are from the same firing (slower cooling is needed to develop the rutile effect). The classic cone 6 floating blue? No, it is Alberta Slip blue. And it contains no cobalt! 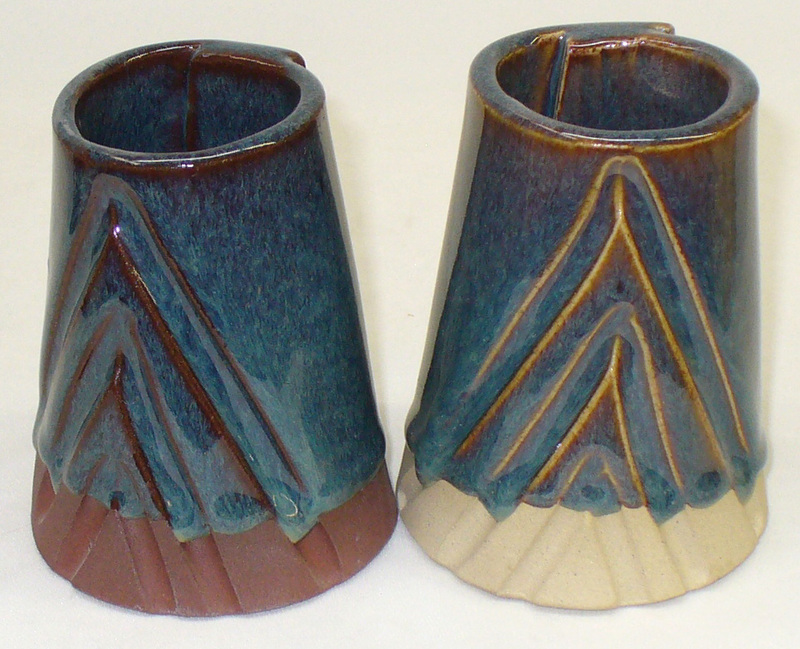 Fairly close in appearance to the classic cone 6 Floating Blue recipe used across North America, this is a variation of the Alberta Slip Rutile Blue glaze (except this adds 1% tin oxide, 1% black copper oxide and 2% ceramic rutile, it is GA6-C1). Because of the melt fluidity, it thins on the edges of contours and breaks to the color of the underlying body. It looks best on dark bodies, but if thick it is OK on light ones also. Cone 6 oxidation. GR6M Ravenscrag version is on the left. 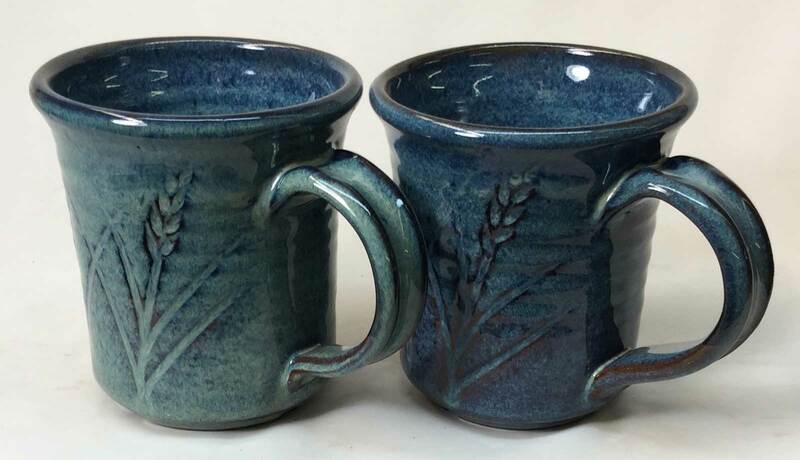 The Alberta Slip version (GA6C) is more fluid, but that also means it will run more during firing and blister more if too thick or on re-firing. 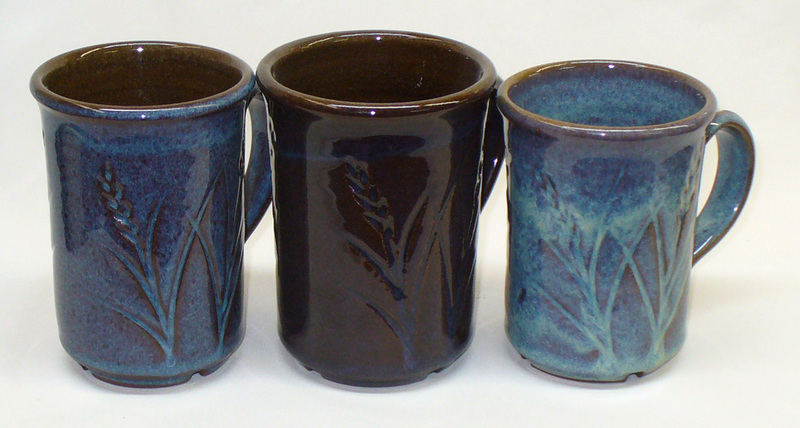 Generally, the Alberta Slip version appears better on dark bodies and the Ravenscrag one on lighter burning clays. 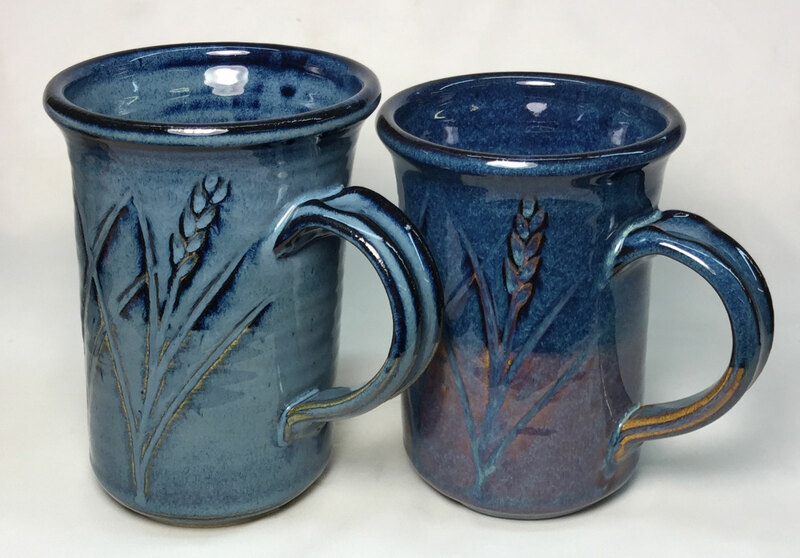 The Alberta Slip version gets its color only from Rutile (and thus requires a special drop-and-hold firing scheduel), the Ravenscrag one produces blue in any firing schedule (although the color will be better in the drop-and-hold schedule). Both have been applied at moderate thickness on Plainsman M325 (using a slurry of about 1.43-1.45 specific gravity, higher values end up getting them on too thick). The Ravenscrag version highlights contours better (the edges are black because of the black engobe underneath). 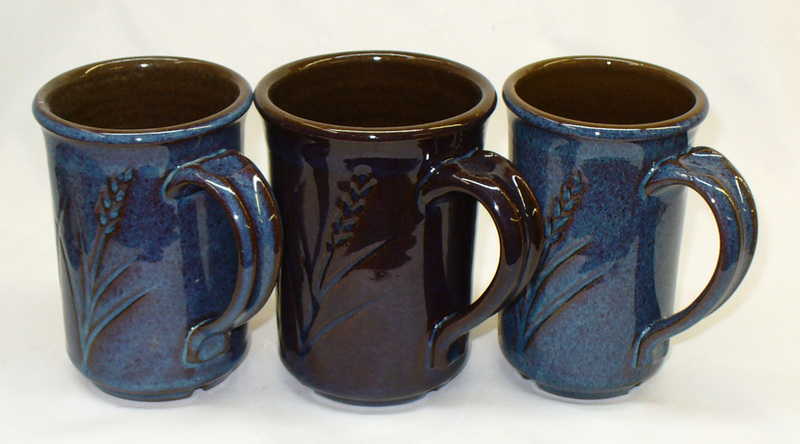 It also produces the blue color whether or not the kiln is slow cooled to 1400F (although a faster cool is less blue). But the Alberta Slip version has zero cobalt so is less expensive to make. It produces a deeper color over the black engobe underneath the upper section of the pieces. Both of these produce a wide range of effects with different thickness, bodies and firing schedules.